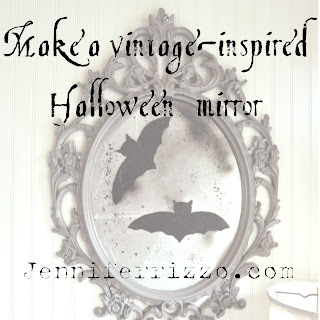 Make a vintage-inspired halloween mirror…. When Krylon asked me to try out some paint, I jumped at the chance. We are getting in the mood for Halloween here and I had a mirror I wanted to dress up and “spookify” a bit. I first used some of that sealing cling wrap for covering food that is a bit sticky on one side to the mirror to give it a hazy appearance. This way I can also spray paint all over it and later, if I want to use the mirror I can just pull it off and the mirror is as good as new! I cut off the excess. The sheets aren’t quite bit enough so you might have to cobble them all together. It’s okay if they get wrinkly, it just adds to the old mirror texture. You could even layer pieces if you like for effect. I then taped paper over the top so I could spray paint the frame. I painted it a really pretty grey color in a gloss finish called Castle Rock. I removed the paper and positioned my bat stencil over the wrap. I just used a homemade one on heavy card stock and sprayed the back with temporary spray adhesive so it would stick while I sprayed it. Here is the template if you would like to use it for bats of your own. So here is the crazy twist. I really wanted flat black to make the “hazy glass” look old and make my bats pop without looking shiny. So I used black chalkboard spray paint!!! I sprayed each stencil, and the removed it quickly and wiped up anything that bled under with a damp cotton swab. The I purposely lightly over-sprayed and even let it drip a bit to give it that old, patchy mirror look. I am looking forward to having it up through Halloween and then removing the wrap for the rest of the year! I might even pull it off and then re-do it just as an old mirror. Krylon is also having a sweepstakes called “Make it Gr8 in 8″ where you can submit a quick fix for a chance to win great prizes!!!! Check out our “Krylon at Halloween” Pinterest Board or be inspired by the fabulous projects in Krylon’s Projects in a Can. And you can click on the projects below to see what my friends Heather At The Picket Fence, Kelly at Electically Vintage and Beth at Unskinny Boppy made!!!! This is a sponsored post by Krylon but the opinions are my own. Hello Jennifer! What a wonderful idea! I will try to make it! Best wishes! I mean, I’m absolutely batty for this! You definitely made it Gr8! Totally different take on a Halloween classic – thanks for the tutorial. What a fun project, Jennifer! Thanks for sharing it with us today! I have to ask you where you purchased the pretty, colorful cups that are stacked next to your kitchen sink in the photo that Tracey @ French Larkspur used in her latest post? I just love the happy colors and would love some for my kitchen! 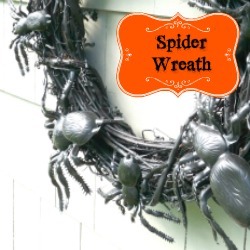 What a cleaver and fun idea! Looks great! Love this Jen! So creative and I like that you can change it out. Using the sealing cling wrap was genius! I love this project Jennifer, what a great idea!! Thanks so much for the tutorial! Thanks so much for sharing at out spray paint link party! It looks great and very realistic looking…. This is a really cute idea. I love it!